The shearing is complete. Now comes the summer-long task of skirting the fibre by hand. We were fortunate to have an article appear in the Manitoulin Expositor which was then picked up by Alpaca Culture. 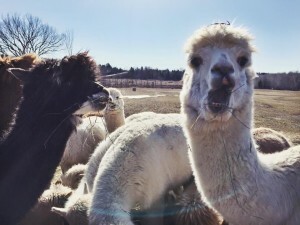 Here is a link to the Alpaca Culture article which in turn has a link to the original in the Expositor. Hello there shearing volunteers! Every year when we shear our alpacas we ask volunteers to help out and there are up to 14 jobs that you can take part in. The jobs vary from being an alpaca catcher to helping skirt the fibre (cleaning it) and you can help out in whichever one you feel most comfortable doing. We only need a certain number of people for shearing and if you decide you want to help us this year you can continue on reading and find out what job you like best. When you have decided let us know so that we can put you down for that job. Shearing this year is May 20, 21st, and 22nd from 8:30am to 5pm or so. We ask that people looking to volunteer come for a least one to all three days. We have to show you how to do your job and that can take some time, it slows the process down if we are teaching new people more than once a day. For those not interested in volunteering but still want to see how the process is being done, we will be having guided tours on Saturday and Sunday at 10:30am and 2pm. If you are interested in this you can come and learn how the process of shearing is done and the process of how we make everything into products that we sell. 1. Catching. The first station is where the alpacas are caught and blown off. We use an industrial blower to push any unwanted dirt or vegetation out of the fibre so that it is easier for us to clean when it comes off of the animal. Catching needs somebody who is not scared of being up close with the animals and has the strength to hold one if it tries to get away. Whoever is interested in doing this job will be helping Noah Albers to catch and blow them off, if you are a little nervous Noah does this every year and knows what he is doing. This requires one person. Maybe 2. 2. Checking. This station requires 1-2 people. These people are in charge of taking the alpaca from the catchers and weighing and checking the alpaca’s micro chip to find out who it is. This year we will also need somebody to take a photo of each alpaca. An identification sheet about each alpaca will be started and passed through the process; this helps us keep records on our alpacas fibre and is sent to the mill with each bag. 3. Assisting Shearing. Station three is where the alpaca is finally one the table and being sheared. The jobs here are the shearers (this job is always done by Richard and Glen and isn’t open for volunteers) 2 people to hold the legs and trim toes, somebody doing teeth and needles (this is done quite often by one of the shearers but can also be done by a volunteer), and last one of the most important jobs is holding the alpaca’s head. The person holding the alpaca’s head needs to be calm, good with animals, and strong. Their job is to make sure the alpaca’s head is not moving. If the alpaca’s head gets free they have strong necks and could potentially hurt somebody while trying to get loose. They also need to keep them calm by talking to them (we get this person to put lavender on their arm because it helps calm the alpaca down, if you are allergic to lavender this wouldn’t be a good spot for you). This station requires 4-5 volunteers. 4. Runner. This person is in charge of taking the fibre off the table when it’s being sheared, putting it into bins and bringing it to the skirters. This station isn’t hard but does need to be done properly. When the blanket (the nicest part on the alpaca) comes of, this person is asked to collect it and put it on the skirting table a certain way and if it’s done wrong it can make it harder for the skirters to do their job. This requires one person. 5. Skirting. At this station, the last step of the shearing process is done. The people doing this job will be in charge of taking any unwanted vegetation and dirt out of the fibre as quickly as possible before the next bin of fibre comes along. The fibre is graded and classified.This station works fast because their job takes longer than the shearers do to take the fibre of the animal and the skirters can get backed up quickly. We can have up to four people working at the skirting table at a time; two of the skirters will be Emilie and Rochel who will teach the volunteers how to skirt. We will need 2 volunteers for this station. 6. Straw Boss. The person doing this job is watching over everything to make sure it’s going smoothly and is keeping notes on the fibre of each alpaca, this year this job will be shared by Emilie and Bridget and if you have any questions during the three days they are the people to ask. They will also be giving tours during the day to people curious to see the process of shearing. We have created a separate space for the tours so that they won’t bother the process or the people working during the shearing but they will be nearby. If you have decided that you would like to volunteer for shearing contact emilie@lobolocoalpacas.com and let us know what job you would like to do and how many days you can do it for. If you have any other questions regarding the farm or shearing you can contact richard@lobolocoalpacas.com or emilie@lobolocoalpacas.com or you can give us a call at 705-968-0073. Note: Remember to dress with layers, even if it’s a nice day outside it is much cooler in the barn than outside and if your job consists of a lot of standing in one place you can get cold quickly. We will provide volunteers who come for a full day or all three with snacks and tea in the shearing room. Lunch and dinner will be given on Friday and Saturday and just lunch on Sunday. This only appears on computer web browsers however (the widget uses Adobe Flash which isn’t supported on iPhone and iPad). Clicking on the wind circle will open the Weather Underground site where you will be able to see weather details and our webcam – the Alpacacam which sends a photo every five minutes. Clicking on the webcam photo opens a calendar where, for any day in the past, you can view individual images or a time-laps of the twenty four hours. We’re coming to the end of 2015 and we’ve now been around the sun twice with alpacas on board.